In light of the significant coverage the Guggenheim’s Hilma af Klint: Paintings for the Future has received, I thought I’d take a fairly unconventional approach that will surely garner raised eyebrows from other art critics––an approach which confronts something that has largely vanished from scholarship, something that is so uncool and out of fashion that hardly a person has mentioned it in their reviews (except behind the anesthetized distance of historical fact––or snark). That is, I’d like to talk about God. God and modern art have been connected since the beginning, either through the spiritualism in many early abstract painters’ work (as in Kandinsky’s famous treatise On the Spiritual in Art) or as a search for the replacement for God (as in the Futurists’ worship of industry, the Surrealists’ the unconscious self, or the AbExers’ color and form). But I ask whether we consider this spirituality with a dose of doubt and whether this skepticism ultimately undermines the work in question. In the case of af Klint, consider Pulitzer Prize winning critic Sebastian Smee’s review in which he asks the question of whether the “image of Klint attending Stockholm séances with her four female friends…dilute[s] the significance of her achievement” or whether it has “no effect at all.” Mr. Smee leaves no room for the possibility that this spirituality, which he clearly looks down upon, might have strengthened her work. Hilma af Klint was born in 1862 in Solna, Sweden. A member of a respectable family (her father was an officer in the navy), she graduated from the Royal Academy of Sweden just a few years after women were first admitted. After the death of her sister she turned to theosophy, a system of religion that believed God could be accessed through intuition and ecstasy. She soon became involved with a group of women who named themselves De Fem (The Five), in whose company she grew and nurtured her spiritual life. 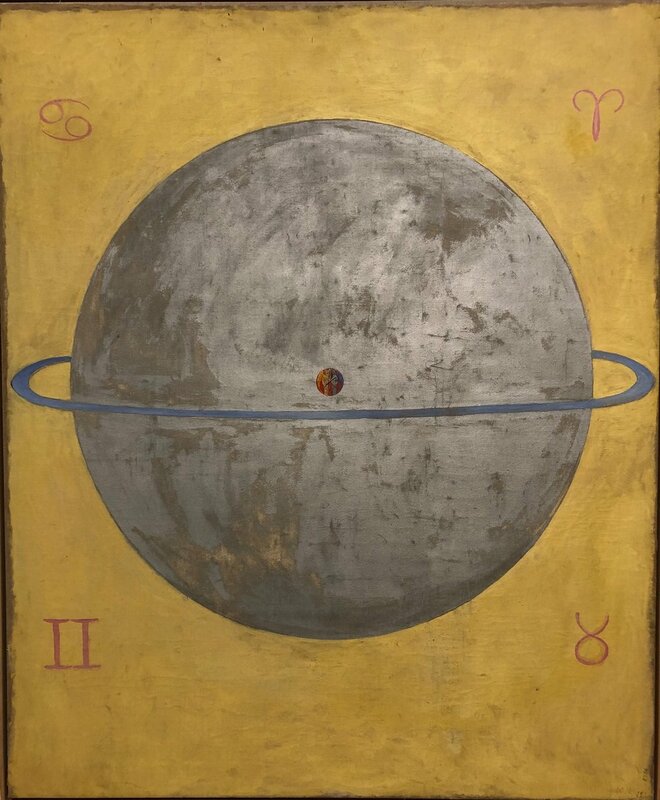 The project “Paintings for the Temple,” for which af Klint is perhaps most famous (if she is indeed famous at all), was taken on by the artist at the behest of one of De Fem’s spiritual High Masters, who sent her a message, in which he insisted she make works that evoked a higher realm. Many of the paintings in the Guggenheim show are from this collection. Now, many have (rightly) insisted on the importance of this show because it begins to rewrite the master narrative of Modernism, which sees abstraction born of Kandinsky, Malevich, and Mondrian in the years following the creation of many of af Klint’s works. But if our goal is to rewrite history, I can’t help but be wary of this take because, after all, the celebration of the framework in which these paintings fit is not a celebration of the paintings themselves. There is an element of condescension in removing the spiritualism from these works, a batty old lady brand of dismissal with which so many women have had to contend (you might call this archetype the “crone” from the female Trinity of “maiden/mother/crone”). Even my beloved New York Times critic Roberta Smith had a hard time resisting the dismissal (Ms. Smith––Roberta, if you’re reading this, maybe we can go out for a coffee and discuss? ), stating she was “not any more interested in the particulars of af Klint’s belief systems” than in the “mysticism that Agnes Martin conveyed when talking about the delicate stripes and grids of her paintings.” This seems a terrible oversight, as the conditions of the works’ creation center on af Klint as conduit. I think we owe it to the artist to meet her where she is and accept the impetus of her art making. Luckily, the Guggenheim itself has not condescended to af Klint in the ways the critics have, partly because of a strange twist of fate. You may have heard that af Klint forbade her work from being exhibited for twenty years after her death. Fifteen years later in New York, ground was broken for the erection of a building eerily similar to the temple in which af Klint imagined her work ought to be exhibited. Completed in 1959, the Guggenheim sat ready for her paintings (though it would take them another sixty years to arrive). When you do see the work in the temple at last, it is clear the Guggenheim has honored her vision. When a group of older museum visitors wondered why the museum started the show at the bottom of the ramp and had us walk up (they complained about the strain on their legs) I thought it couldn’t be more obvious: we were ascending towards God! The slow unfurling of af Klint’s canvases, beginning in primordial abstraction and ending in geometric symmetry, was one such example of this revelatory trajectory. The show is a spiritual pilgrimage and, as with all pilgrimages, some discomfort is necessary. But, if you’re writing me off right now because my interest in the inexplicable and the divine is losing me credibility, at least consider this. Much of the reception of this show is taken through the lens of revisionism, but, as a wall text states at the bottom of the ramp, the early twentieth century saw many women turning to spiritualism as a justification for their art making. That the artist in question was a conduit for the divine can at the very least be seen as a convenient way of getting around prejudices that faced female artists at the time. There is something gained in maintaining this historical lens, in thinking of af Klint’s divine artistic directives as more of a coping mechanism and less as “spiritualist hokum,” as Smee suggests. If this is indeed the case, we should be taking De Fem not as a group of women who had lost their marbles, but rather as a radical feminist group who adapted to their circumstance. Women have always made space for themselves. Af Klint was no exception. 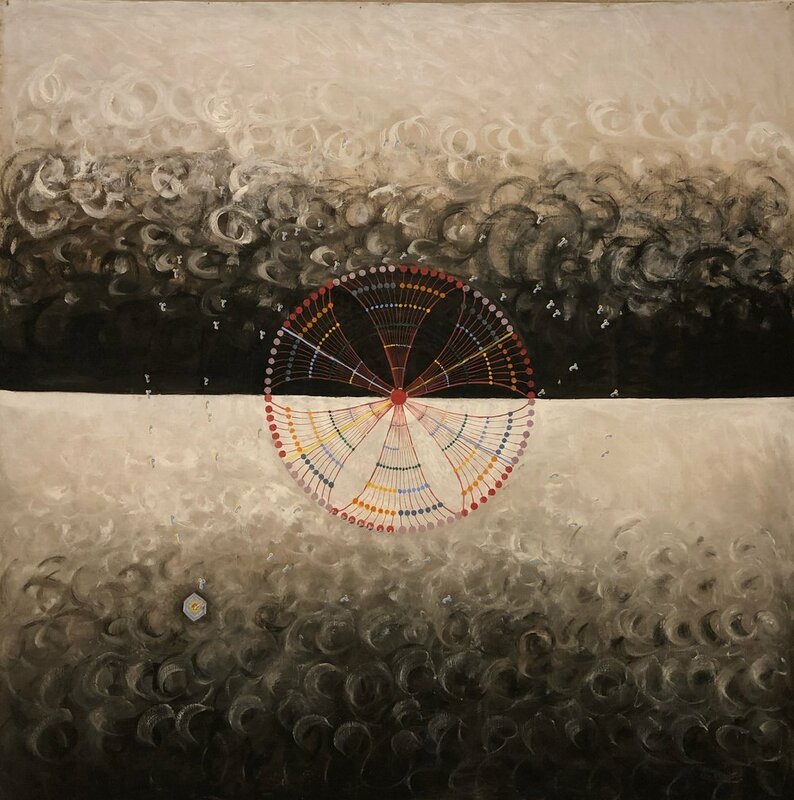 Hilma af Klint insisted on hiding her work so that when it was finally exhibited it might be understood. I wonder, though, if we’ve waited too long, if our society, increasingly lost spiritually, has stepped beyond a moment that could take this woman––and her art––seriously.